The site object of the field test is located within an operant engineering company located in the province of Ravenna. The first subsoil consists of alluvial sediments with alternating sands and silts where circulates a phreatic aquifer with an average thickness of about 5 m and depth to groundwater of about 10 m from ground level. Groundwater were found contaminated by chlorinated compounds (Tetrachlorethylene-PCE, Trichloroethylene-TCE and their by-product of the dechlorination process) with overall concentration up to 80.000 ug/l. Two SmartStripping® wells of injection/extraction, served by an air circulation system powered by a blower, were prepared on site. 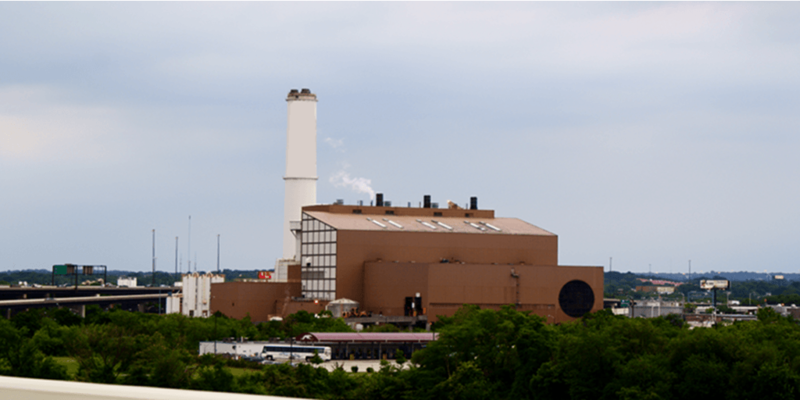 The plant was located near the extraction wells of a Pump & Treat plant already present in site. On site there was also two ” Soil Vapor Extraction” (SVE) plant in activity. The groundwater were monitored by 5 piezometers installed respectively at 13, 35, 45, 70, 80 m from the SmartStripping® wells. 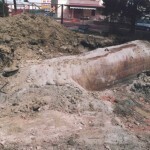 This field test permitted to compare three different remediation techniques in the same site-specific conditions and to measure the effects of each implemented system. 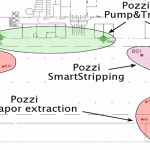 During the period of 2 months of activity of the SmartStripping® plant, given the proximity of P&T wells, have been adopted some regulations also to facilitate the removal of contaminant by the P&T plant, allowing us to understand if it’s possible to reduce the remediation time by improving contaminants extraction by the Pump & Treat plant, using SmartStripping® technology. After 3 month from the beginning of field test, concentrations of chlorinated compounds in groundwater extracted from P&T wells increased by 8 times (80.000 mg/l) compared with baseline. 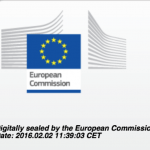 At se same time, SmartStripping® also allowed to extract a mass of about 130 kg of contaminants from groundwater through the purification of the air flow of the “closed-loop” re-circulation system. 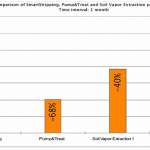 The comparison between the technologies operating in site, Pump & Treat, Soil Vapor Extraction and SmartStripping®, show the specifics performances in term of mass of contaminants removed in one month, under site-specific conditions. 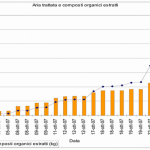 SmartStripping® proved to be more effective: in a month of activity it allowed the extraction of about 60% more than others technologies, with a rate of approximately 65 kg/month of volatile organic substances from subsoil. 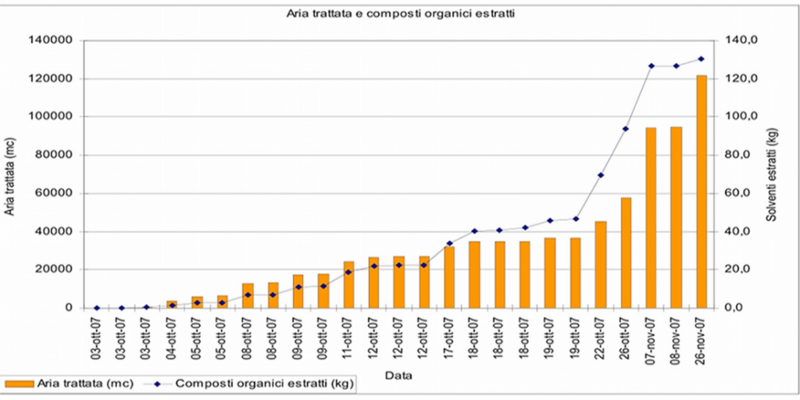 the average extraction rates of SVE and P&T, instead, results respectively 17,8 and 8,8 kg/month. 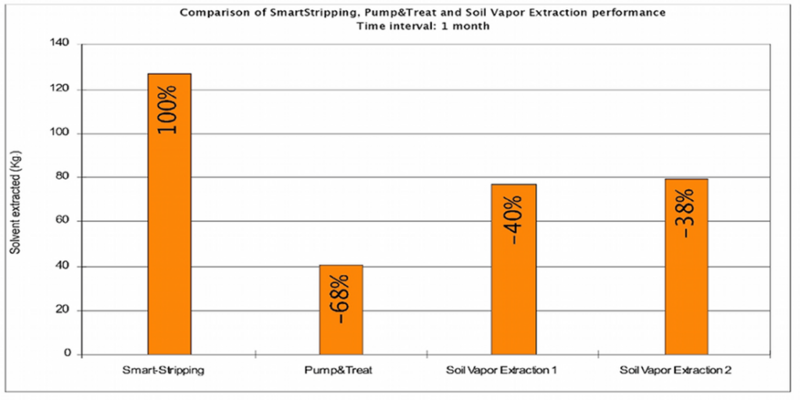 The application of SmartStripping® technology allowed to increase the extraction efficiency of the Pump and Treat plant already present in site, finally reducing the time for remediation. The plant has also cleaned about 13.050 cubic meters of groundwater, corresponding to a portion of the aquifer of about 10.000 square meters, without removing it from the aquifer and avoiding waste water discharges; 12.000 cubic meter of air have been also treated by the plant and not emitted to the atmosphere.